While researching some of my husband’s Kittitian ancestors who settled in Harlem in the early 1900s, I have been coming across lots of information about immigrants from the West Indies, and their influence on the Harlem Renaissance period of the 1920s. Escaping the decline of the sugar industry and looking for better economic opportunities in the north, West Indians immigrated to New York City in large numbers. By 1930, almost a quarter of Harlem residents were West Indian. The influx of West Indians, along with African Americans from the American South, led to a unique mix of artists, writers, musicians, professionals, and entrepreneurs. One ancestor was a Marshall from St Kitts, whose occupation in 1917 was listed as musician on his World War I draft registration card. He and his family lived on West 138th street, in the heart of the West Indian section of Harlem. In a 1923 article from Harlem newspaper The NY Age, our Mr Marshall is listed as treasurer of a club that is hosting a charity event to benefit the NY Urban League’s Convalescent Fund. The event was a dance to be held at the Renaissance Ballroom and Casino, located between 137th and 138th. Unlike some Harlem venues like The Cotton Club, the Renaissance was built and run by black businessmen, and catered to a black audience. 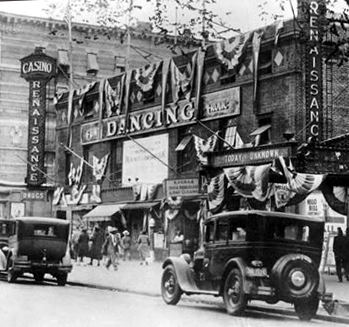 In addition to dances featuring popular orchestras, the ballroom hosted a variety of charity events, movies, community meetings, prize fights, and even basketball games featuring the Harlem Rens, the first professional team composed only of African American players. The Renaissance Ballroom was owned by West Indians from Montserrat and Antigua, and the Rens team was founded by Robert Douglas from St Kitts. The ballroom has now fallen into ruin, and was never successfully declared an historic landmark. It is scheduled to be torn down and replaced by an apartment building. inmotionaame.org: The Schomburg Center for Research in Black Culture presents In Motion, The African American Experience; Caribbean Immigration; The NY Public Library 2005.
ancestry.com, World War I Draft Registration Cards, 1917-1918.
fultonhistory.com, Old Fulton NY Post Cards, digitized newspaper archive, 2002.
harlemonestop.com, Hamilton Heights West Harlem Community Preservation Organization, 2014. NY Times, A Harlem Landmark in All but Name, 2007.
just happened onto your site!!!!!! loved your post as my family immigrated from Monserrat in the 1920’s(mom’s side). Do you have any names of the owners of the Renaissance??? The partners who owned the Renaissance were Cleophus Charity from Antigua, along with William Roach and Joseph H. Sweeney from Montserrat. Cannonier – what’s in a name?